On a classic claret and blue shirt exclusively tailored and manufactured for Philosophy Football, this is a strictly limited edition of just 1112 garments, one each for the years 1904-2016. England's 1966 World Cup glory was made in Upton Park. 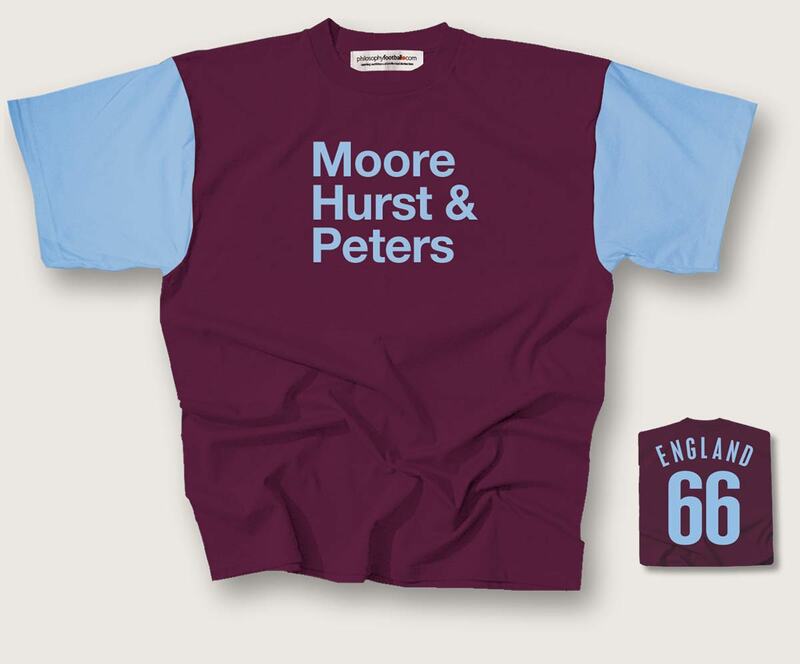 Captain Bobby Moore unarguably the greatest ever to wear both claret and blue and the Three Lions.Hat-trick hero Geoff Hurst a feat in a World Cup Final that has never beeb marched.Midfield artist and scorer of England's other goal? The young Martin Peters, a player so gifted he was described by Alf Ramsey as being 'ten years ahead of his time'. West Ham winning the World Cup, one of the Boleyn Ground's biggest and proudest boasts. Unisex sizes small (36inch chest/90cms), medium (40inch/100cms), large (44inch/110cms), XL (48inch/120cms) and XXL (52inch/130cms). Plus! Women's fitted (34-36 inch chest/70-90 cms/ size 12). Available as listed in the drop-down menu below. Gift-wrapping service. With Philosophy Football wrapping paper and gift tag. If you would like us to personalise your gift tag type in the message for us to add in the box provided below.